Enjoy the best selection of fruits, vegetables, honey, and creative natural booths filled with tempting goodies. The event starts early Saturday morning and makes the weekend so enjoyable. 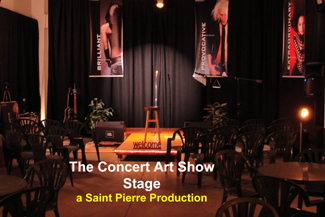 It's our music performance under the trees with natural rock seating featuring Saint Pierre's new ambient instrumental master guitar album. It's a free show. Our art students will be performing amazingly. "FREE FACE PAINTING FOR THE KIDS". Food Truck has your hot coffee & tea, and a full breakfast menu on the picnic tables. "Don't Worry Be Happy... The Best Things In Life Are Free"
This Music Video was produced by Saint Pierre, and made possible by MusicAndArtForYouth.org, Helping Needy Kid Artists 9- 19 years old by providing FREE Student Scholarships: "One Kid At A Time". We are proud to present this entertaining service to the community! Amazing arts and inspiration, including a "ONE OF A KIND" experience that you will remember for a life time. It's one of the best in Ventura. The video is an original production by Saint Pierre, Director of our Non Profit Organization 501 (c) (3)..
Music And Art For Youth strives for purposeful opportunities to make the world a better place to live. We offer ways to make an investment in our next younger generation. Thank you for "Helping The Kids".